We’ve started off 2019 on a high note by growing our family of ball pythons with two new girls! A juvenile Cinnamon Pinstripe Sugar, and an adult Fire Woma het Hypo. They’re still settling in and will of course be in quarantine for three months, but we look forward to showing them off and getting proper photos of them after that time! 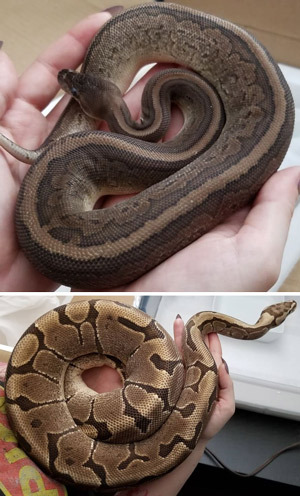 We got them both from Jhun, aka: Ballistic Pythons, and we couldn’t be happier with the girls’ very apparent health and his great service. Definitely a great Canadian breeder to support! Our newsletter has already been updated with how this year’s breeding season is going. We’ll be making some updates here soon as well, but if you’d like to read our latest newsletter to see where we’re at now, you can view it here!